There is a saying - albeit sexist - in Italy: Donne e motori, gioie e dolori. Translated, it reads: "women and cars give joy and pain." It's fitting, then, that Alfa Romeo is Italian. Many an Alfa owner can tell painful tales of electrical circuits whose life expectancy could be measured in nanoseconds, and of metalwork fizzing in the rain. Yet, if you're a card-carrying Alfista, all is forgiven. For nothing can make the hairs on the back of your neck stand on end like the joyful cry of an Alfa at full song. Even in the darkest days of Alfa's past, the brand remained a benchmark for involving handling. A mid '70s poster enticed, "Alfa. Let's ride and ride until the sun comes up." The proposition was cars with heritage, soul, and charisma that Detroit, Munich, and Tokyo could not quite match. Cars with breeding, their underhood credentials irrefutable; from their all-alloy, dual-overhead-camshaft engines to their rear-mounted gearboxes (just like Alfas of '50s Formula One); their De Dion with Watts linkage rear axles, and their vented front and inboard disc brakes. This was the era of the Alfetta sedan and Alfetta GT coupé, this latter sometimes referred to as the GTV or Sprint Veloce. Alfa itself could never quite decide. It appears never to have occurred to the Italians that a more consistent naming scheme might have helped them become better established in the elusive U.S. market. Mind you, the car was late to America. Tightening exhaust-emissions standards resulted in no Alfas being marketed in the United States for 1972. When it finally arrived Stateside, in 1976, the Alfetta GT was among the most extroverted, highly styled cars on the market. Its lines had been inspired by Giugiaro, who had referenced his earlier Fiat Dino and Isuzu 117. The master would later refute his involvement when Alfa changed some of his details (among them, pop-up headlamps). Some saw the curves and undulations as a sporting statement, while at least one magazine uncharitably described it as "unbalanced." Objectively, though, there was little wrong with it. The coefficient of drag was exceptionally low, equaling the new Rover 3500 at 0.39. Alfa credited the deep two-part front spoiler. To drive, too, the car was balance personified. It shared its mechanicals with the Alfetta sedan, inheriting the near perfect, 50:50 weight distribution enabled by placing the transaxle at the rear. It was a fine GT car, one with responsive handling, an affinity for high-speed cruising, and a penchant for returning all the tactile and aural feedback an enthusiastic driver could wish for. There were, however, compromises. Inside, Alfetta GT's dashboard seemed more a collection of parts than a cockpit, and both its rear seat and trunk were often deemed impractically small. American magazines felt that the driver's seat suffered from what some felt was excessive lower-back support, and although the cushion was adjustable, it was short, and the adjustable steering-wheel did little to alleviate this. Nonetheless, Alfa claimed that its seats were highly rated by orthopedic specialists. "We believe them," wrote Road & Track, adding, "but then orthopedic shoes can be uncomfortable too." More seriously, Alfa electrics in this era were notoriously unreliable. Electrical gremlins were part and parcel of the Alfa experience. As a general rule, Alfa picked questionable places to ground things: tabs on the door, or in the hatch area. When the grounds failed, strange things would happen. The distributor cap, too, was a frequent source of woe. The coating of the wire used inside the cap would degrade from ozone, leading the wires to touch each other and burn out. Sunroofs leaked, door locks could fall out, interior pieces worked themselves loose, and the doors could need to be slammed hard to shut properly. Nonetheless, in June 1975, Road & Track named the Alfetta GT to its list of "10 Best Cars for a Changing World;" specifically, in the $8,000 - $12,000 Sports GT class. Alfas remained an acquired taste. Just 13,715 Alfettas - sedans and coupes - were sold in America from 1975 through 1979. In that time, the only other manufacturer to offer a De Dion-equipped car in the United States was Aston Martin. Alfa would enter the '80s with no more than a hundred and forty-one dealers across America. On the Sprint Veloce/ née Alfetta GT, Bosch electronic fuel injection replaced the mechanical (and troublesome) SPICA system. But 1982 would bring major changes. The adage that when you bought an Alfa, you bought the engine and the car came as a bonus, was perhaps best proven with that year's GTV6. 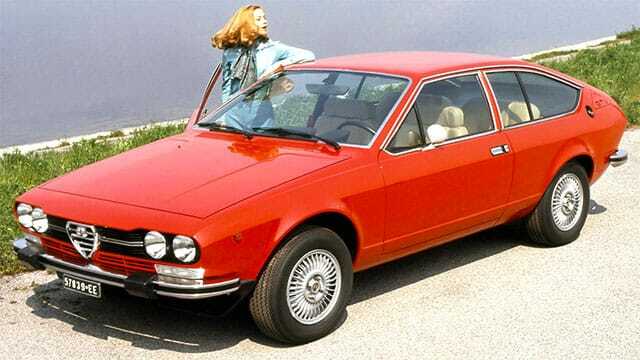 Alfa had shoed six cylinders into the Alfetta, reinventing a car that was getting on in years by drowning its issues in the substantial aura of its wonderful 2.5-liter V-6. "The gentle wheezes of the fuel injection and the authoritative hum of the exhaust are instantly swallowed by the gratifying snarl of the engine at full bore," said Motor Trend, who called the GTV6 "a throwback, an exuberant miscreant, a guts-ball ripper straight out of yesterday." Car and Driver found an engine noise "enough to push any one of us to hitherto unscaled heights of irresponsibility." One hundred and sixty horsepower (@ 5,500 rpm) was roughly fifty percent more raw power than that of its four-cylinder, twin-cam sister. That was good for a 9.8-second run to sixty miles per hour from rest, five seconds from forty to fifty-five miles per hour, and a sixteen-second quarter mile (@ 82 mph). These numbers suffered from a tallish third gear, although fuel economy, at 19/ 26 mpg cty/ hwy, was good for a performance car. Acceleration measurements also told nothing of the engine's smooth, quick responsiveness. Alfa claimed a top speed of one hundred and twenty-eight miles per hour. The drivetrain was upgraded to cope, with a heavier driveshaft over the four-cylinder car, beefier half shafts, stronger transaxle parts, and a twin-disc clutch assembly. All GTV models got a power bulge on the hood, to accommodate the Bosch fuel-injection system, and a revised dashboard which grouped all instruments together behind the steering wheel. This was now a less compromised purchase, particularly in GTV6 form, offering excellent performance, an impressive bloodline, and an attractive price. But if there was reason to get comfortable in the seat of a GTV6, then that did not always seem possible. Like all Alfa Romeos of the era, the car forced what Car and Driver dubbed the "traditional Italian 'Ciao, Sophia' driving position. "In order to reach the top of the steering-wheel rim or the dashboard controls, you must put the seat's backrest into the full-upright position. "This brings your head into contact with the headliner. "So you crank the backrest down a degree at a time, trying to find the perfect compromise among headroom, spayed-out legs, attitude of command, and the necessary leverage to turn the wood-rimmed steering wheel. "Forget it, there is no such compromise." The steering itself, though feelsome, could also seem unnecessarily heavy. New wheels and Pirelli P6 tires on later models did little to resolve this, or the twitchy tail. To be fair, when breakaway came, it was predictable and easily fixed with some opposite lock and throttle modulation. "There is none of the rough-surface uncertainty sometimes associated with the Porsche 924 Turbo," clarified Motor Trend; the GTV "simply feels as safe and as solid as stone, overqualified for its job." The all-around disc brakes - vented 10.5-inch discs up front and ten-inchers at the rear - stopped the Alfa from fifty-five miles per hour in one hundred and twelve feet; an excellent result. Motor Trend called the GTV6's braking performance "the sudden vengeance of a parachute," with "excellent" pedal modulation, "even in the rain and even when it is stomped hard." The gear change was as poor as ever, owing to the distance it had to run to the transaxle. Changes for 1986 would make it better, but never anything near perfect. Meanwhile, as Car and Driver put it, "first gear is too short, and the shift linkage is vague and suffers from too much detent, but pretty soon you won't care about that either. "What you have here is a time machine. Return with us now to those thrilling days of decent power-to-weight ratios and right-now throttle response." For Motor Trend, Ro McGonegal agreed, concluding that the GTV6 was "the kind of car they don't make anymore;" a wanton lustful machine which offered its driver the opportunity to experience a sense of oneness with an automobile. "About fifteen minutes of fast-pacing in this Alfa will do more for personal motivation than an eyedropperful of vitamin B-12. "In an automotive world that's almost awash with high-tech appliances, here is a car that's still capable of generating love affairs." Echoed Car and Driver, "Some day you'll be asked to define the term 'sports car.' When that time comes, just show 'em this Alfa Romeo." Alfa sold just 3,700 cars in the U.S. market in 1985. A decade earlier, Popular Mechanics had been moved to suggest that Alfas simply offered more than most American drivers knew what to do with. Auto editor Bill Hartford cited the results of a survey done for GM by Calspan, which showed that the overwhelming majority of typical drivers tested in emergency situations either locked up their brakes or just plowed through the pylons placed in their path. Car and Driver had a different take, speaking of the GTV6 as aging and noting that "growing old can be a terrible thing." It had, the magazine reminded readers, been around since 1974. Changes to the gearbox - including shift linkage, shift forks, selector sleeves, and synchronizers - had eliminated the earlier car's crunch when selecting first gear, diminished gear whine, and improved the 0-60 mph time to 8.2 seconds. But the magazine's example was equipped with Michelin TRX tires, which promoted understeer and seemed to exacerbate the heavy, unassisted steering; the driving position was as compromised as ever, and that the car's tough urban ride became fluid and supple at eighty miles per hour seemed an anachronism in the throes of America's fifty-five mile-per-hour speed limit. The engine remained its most impressive feature, pulling willingly from 1,000 rpm in top gear, with "jewel-like smoothness" throughout the rpm range. "Whether the GTV6 will be replaced is uncertain in the wake of Alfa Romeo's takeover by Fiat in 1987," wrote one journalist. "If we're lucky, the new owners will replace this spirited but aesthetically awkward coupe with something truly modern - dare we say futuristic? - and that should be well worth waiting for." The death of the GTV coincided with the Fiat takeover. It would take eight years for it to be replaced, by a rather different coupé bearing the same name.